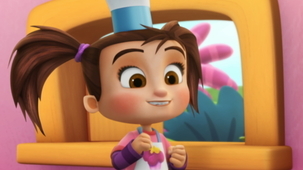 Kate and Mim-Mim is also available on Mini TFO A section just for the kids, without ads! Click to explore! Kate wants to pin the tail on the donkey, but she can`t. In Mimilou, Kate and Mim-Mim want to race with their friend, Oggy the frog, in a leap race. PAPA bande les yeux de KATE. Ensuite, il fait tourner KATE. on n’est pas les meilleurs? Oups. on ne pourra plus la coller. autre façon de jouer, Mim-Mim. Une grenouille droit sur nous! aussi douées que les lapins! que des pattes de lapin. mais ce n'est pas nécessaire. et je vais le prouver! vite avec vous, les grenouilles! que je suis le meilleur sauteur. haut ou aussi loin que toi. Ha-ha... Que rêver de mieux? ça va nous aider à gagner! une danse de la victoire! cette course, vous savez quoi? ce que vous faites est génial! pas voir où elles vont. les grenouilles se fassent mal. on ne peut pas gagner! super haut et super loin! à travers les nuages, papa! de gagner à ce jeu. Tu as heurté le mur! Dad puts a riddle to Kate that she struggles to answer. 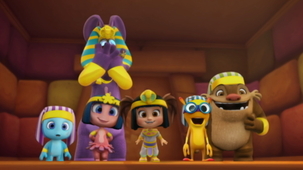 Mim-Mim finds in Mimilou an enchanted ring that starts our friends onto a hunt for Tut-n-Bunny`s treasure. They`ll find a sphinx on their way, who will present obstacles to their quest. 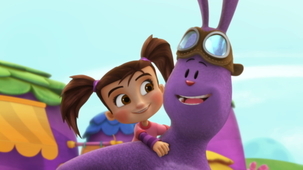 Kate has an idea to help a stuck bird to get out of the house, but her parents don`t hear her in all the mayhem. In Mimilou, a group of lemmings is in danger. Amazed by the grasshopper`s jumps, Kate decides to capture it, but as soon as it`s inside the jar, it calms down instantly. 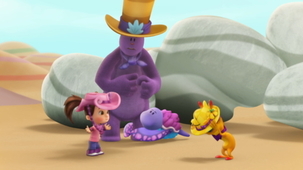 In Mimilou, Kate and Mim-Mim help Lily catch the Mimicritters to study them. Kate would like to have blue eyes just like her mom. 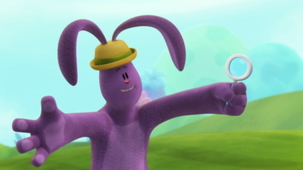 In Mimilou, Mim-Mim thinks his bunny fingers make him clumsy. He finds a genie and makes a wish: to be different, so that all his friends appreciate him. Kate can`t help her parents because she`s too small to carry the flower pots. 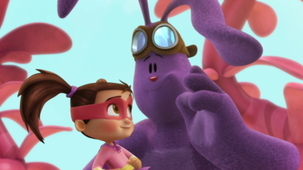 In Mimilou, Kate and Mim-Mim have been shrunk down to the size of insects by Tach`s size-switching violet petals. They have to get back to normal somehow! 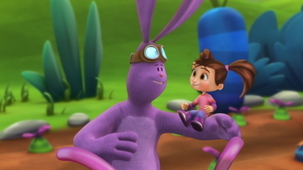 Kate wants to find four purple buttons for Mim-Mim`s new plush shirt. The task will take a while because of the huge amount of buttons to sort through. In Mimilou, Gobble uses Tach`s Copy-Remote to make copies of his tree. The family visit to the zoo is cancelled because of the rain. Mimilou, Kate and Mim-Mim give their friends a hand to make their own zoo with bushes and hedges. Kate wants to jump rope, but she can`t keep a steady rhythm. In Mimilou, Gobble is seized with sneeze-sniffles that only Badababees` honey tea can fix. To get it, Kate has to help her friends find a rhythm. Kate`s ball is stuck in a tree, but she can`t jump high enough to get it back and she tries to imagine what it would be like to have superpowers. Kate discovers that her mom finished her plushie on the day she was born, which means she shares Mim-Mim`s birthday! In Mimilou, Kate and Mim-Mim secretly plan a surprise party for the other. Dad gave Kate a big empty box to play with! In Mimilou, Tach is out of ideas, because his board of big ideas and box of big ideas are empty. 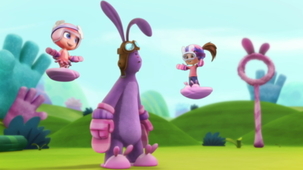 To help his friend find his inspiration again, Kate and Mim-Mim have to get involved. Kate loses her patience when playing mini-golf in her garden. In Mimilou, it`s invented games day, and Kate helps her friends to combine the best aspects of their favourite games to create a brand new one! Kate wants to fix her animated pop-out book without her mother`s help. In Mimilou, all get ready to say goodbye to the Butterflowers who will fly off at sunset. Tach tries to build his own lighthouse to get a front row seat. Moths are keeping Kate and her parents from enjoying their meal outside at night. 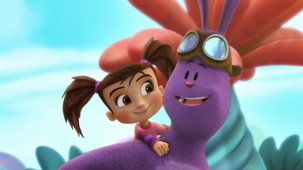 In Mimilou, all of Kate`s friends hide from a dragon who wants to eat Gobble`s moonflowers! They discover the dragon isn`t mean at all! Kate`s night light doesn`t work and she`s afraid to sleep in the dark. 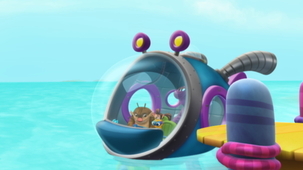 In Mimilou, Kate and friends explore the depths of the Harmonious Sea, but Mim-Mim is afraid of the dark waters and the scary creatures that live in them. One of Kate`s cookies vanishes when she looks away! 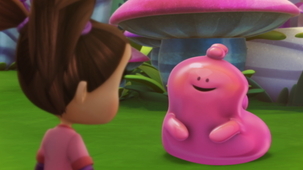 In Mimilou, colourful objects mysteriously vanish. Detectives Kate and Mim-Mim follow the clues to discover the colour thief`s identity. Kate wonders what`s wrong with her birdhouse - the birds won`t come near it. 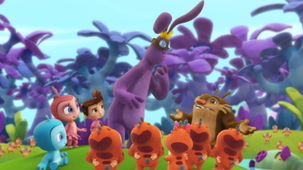 In Mimilou, Kate, Mim-Mim and their friends offer to babysit a shapeshifting baby squoosh so that its mother can concentrate on the construction of their nest. 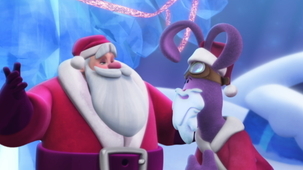 Kate must save Christmas by making her friends` wishes come true, just like Santa.